China in Africa: The Real Story: China-Africa Oil Ties: How Different from the US? Quoting journalist Howard French, the report says that "unlike the West, China 'has declined to tell African governments how they should run their countries, or to make its investments contingent on government reform'." And quoting Fanie Herman and Tsai Ming-Yen, the report says: "The U.S. focuses on humanitarianism, good governance, and democratization of petroleum-producing states in their oil diplomacy approach," unlike China. I would have expected better than this in a report coming from the Council on Foreign Relations. Is the US oil diplomacy approach really focused on good governance and democratization in Equatorial Guinea, Angola, or Saudi Arabia? I don't think so. Have Western companies like ExxonMobil, Freeport McMoRan, American Tobacco, etc., made their natural resource investments in Nigeria, Chad, the DRC, or Zimbabwe contingent on governance reform? Again, I don't think so. Clinton kicked off her trip with a speech in Dakar by saying the U.S. will seek out business opportunities but not at the expense of democracy and human rights. 'The United States will stand up for democracy and universal human rights even when it might be easier or more profitable to look the other way, to keep the resources flowing. Not every partner makes that choice, but we do and we will,' she said. 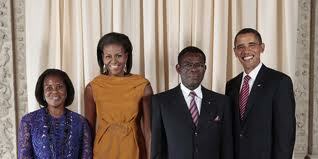 Below is a photo of our president and his first lady smiling with the President of Equatorial Guinea and his first lady. 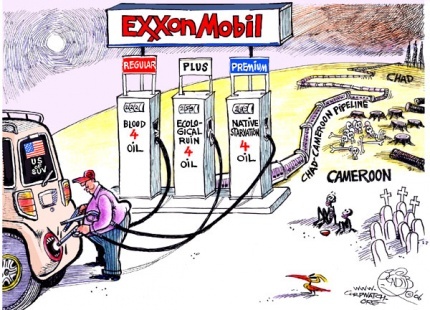 The dictatorial government of Equatorial Guinea is a serial human rights abuser, but it's oil rich, and US companies are the beneficiaries. These are the real choices we're making. We're more likely to have a solid basis for understanding Chinese engagement in Africa if we in the West stop assuming that we're the good guys, that our oil diplomacy is pure, that our companies wouldn't think of investing in a non-democratic country ... "unlike China". Hypocrisy and naivety seem limitless when it comes to comparisons between the 'West' and 'China'. It is 'obvious', for example, that US oil diplomacy has been hugely 'effective' in driving 'good governance' in Equatorial Guinea... come on. Even in journalistic reports that are supposed to be independent we see countless examples that are contaminated with the so familiar "Holier Than Thou" viewpoint. The "Council on Foreign Relations" report is of course, no exception, and to tell you the truth, I never expect it to be of any difference anyway. If the Western oil companies are such good social citizens and they have such successful progress in "teaching" the Africans about the "good Western qualities" such as democracies, integrity, fairness, and so on, we wouldn't have any mess at all in Nigeria and Gabon and so many other African countries, right? How many decades have the Western oil companies operated in Africa? How much progress Africa has had under the "decades of tutelage" of the Western oil companies? Judge not, lest thou be judged.